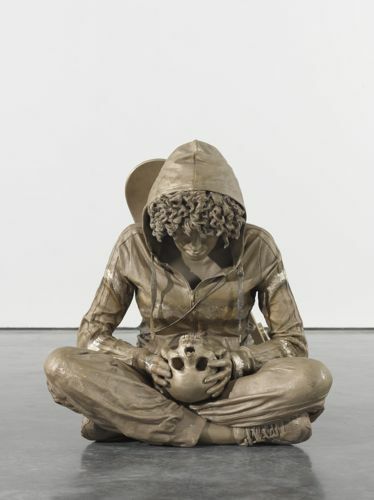 It is surprising that Marc Quinn hasn’t exhibited in Turkey before – as one of the Young British Artists, Quinn’s poetic sculptures, paintings and drawings have earned him the tag of one of the leading artists of his generation since he came to prominence in the early 1990s. 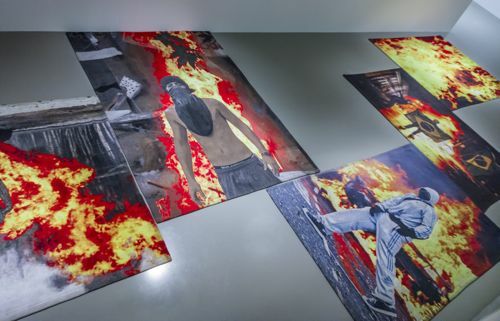 What isn’t a surprise is that ARTER is hosting Quinn’s first solo show – if any art institution was going to step up to the plate, it would be ARTER which consistently shocks and delights with its impressive exhibitions. 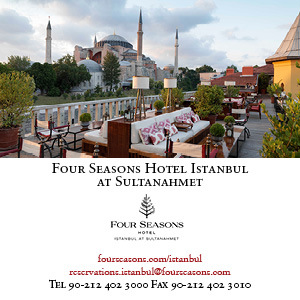 The exhibition is spread over four floors with each floor designed as sort of its own exhibition. Quinn worked closely with the curator Selen Ansen to select the pieces, which mostly comprise his newer works with one to two older pieces. ‘What I do looks very different, but the themes are continuous,’ say Quinn of his oeuvre, which examines our relationship with ourselves, our bodies, nature and the world. On the ground floor, we are greeted by a massive sculpture of a shell (main image). In fact, it is so big and sparkly that it pulls you in from the street. The sculpture was made by scanning a real shell with the ‘biggest 3D printer in the world’, says Quinn. It was printed as a three-metre sheet of plastic and took three months to form into shape. Then, Quinn sprayed-painted the back bronze and the front gold. By taking something so wondrous from nature as a shell, Quinn is questioning whether art is created from the world of the artist or whether artists are discovering the art already present in the world. My favourite pieces on this floor are two paintings from the ‘Flesh Painting’ series (2012–ongoing). 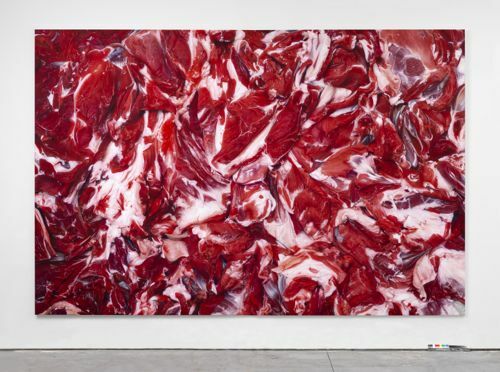 Seen from afar, you could be forgiven for thinking that you are looking at flowers or a detailed tapestry, but in fact in these works, Quinn captures both the beautiful and grotesque nature of raw meat. The artist is undoubtedly influenced by Dutch still lifes, drawing our attention to the details: the fat and the deep red of the veins become abstracted as they are so magnified. It is as visceral and powerful as art gets. Quinn became fascinated with bonsai trees when he first saw them at a garden show in England. ‘Bonsai trees are all about the human desire to control nature. By making the bonsai tree bigger, it is as if this control goes out of control. It is nature coming back to get us,’ says Quinn of the above piece which was made using 3D technology. ‘I believe 3D scanning and printing will have an effect on sculpture in the same way that photography had on painting in the 20th century. 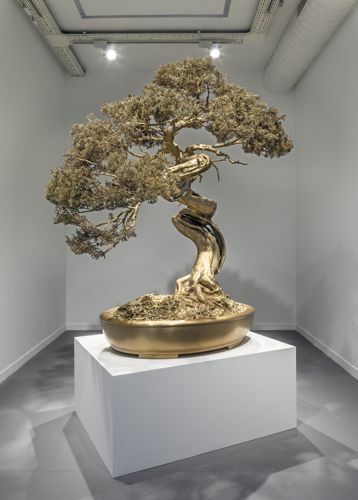 You couldn’t make such a detailed sculpture of a bonsai tree before – you would have run the risk of making a pastiche of it,’ says Quinn. But with 3D technology, codes like DNA are fed into a machine and an exact replica of the object – only smaller or bigger – comes out. ‘It is a technological version of a biological reproduction,’ he says. On the first floor, most of the works examine our relationship with our bodies. There are six white marble sculptures, five of which come from a series of sculptures of amputees that Quinn began in 1999. These sculptures use Greek and Roman statuary and their depictions of an idealised whole to celebrate different kinds of beauty. If a fragmented body is considered to be art, then it should be accepted in real life as well. 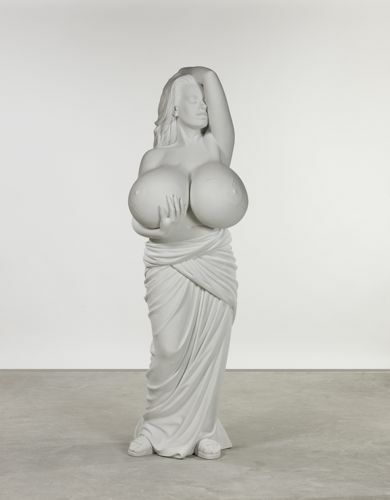 But I particularly like the above sculpture of American model Chelsea Charms who has had multiple breast surgeries. Exploring modern society’s obsession with the human body, Quinn brings elements from classical sculpture – Chelsea’s hair wisps around her neck and the drapery hangs loosely off her hips – and combines it with an example of a today’s ludicrous beauty standards. 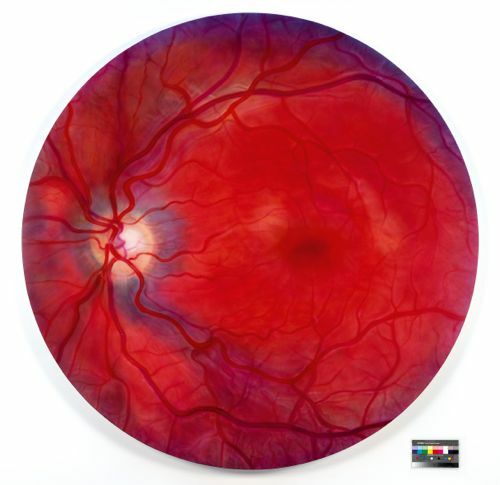 The above painting shows the inside of an eye at the retina – a tiny layer of tissue which is responsible for filtering all the beauty and horror of the world. Quinn created his first ‘Self’ sculpture in 1991 but the one displayed at ARTER is a newer version made in 2011. Quinn went to the doctor for one year who took out a pint of blood each time. 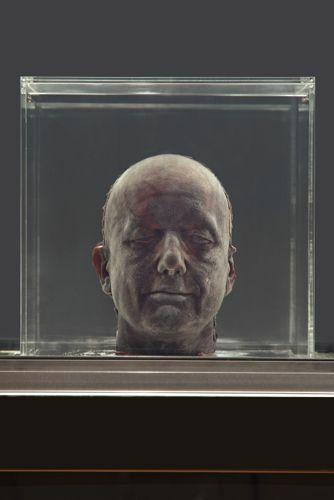 When Quinn had enough blood, he poured it into a mould he made of his own head and froze it. It is kept in a special box that allows it to be seen, but if you unplug the box or there is a power cut, the sculpture becomes a pool of blood. ‘It is a self-portrait of life in a way because it is dependent on something and if you unplug that something, it disappears,’ says Quinn. Also on the second floor are two life-like bronze sculptures. The above depicts a hooded young woman sitting cross-legged and holding a skull in her hands. Based on the Spanish painter Francisco de Zurbarán painting of a monk, this figure is a pilgrim from the streets contemplating her own mortality. When you come up to the third floor, an even stronger feeling of death envelops. The two ‘Matter Into Light’ sculptures – one called ‘Energy is Neither Created nor Destroyed in the Universe’ and the other ‘On the Transformation of Energy’ – are eerie to say the least. 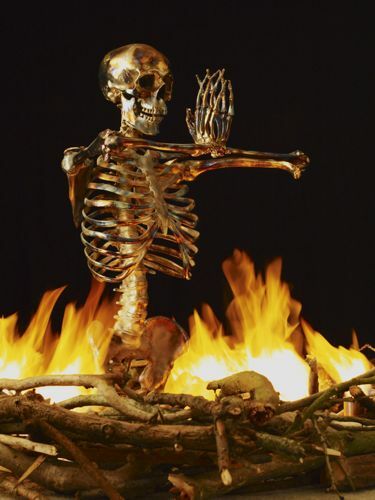 Set in a dark space, the bronze figures are depicted in serene yogi poses despite being engulfed by flames – an examination of the continuous state of creation and destruction in the world. The most compelling work for me is the above sculpture. Immediately, Goya’s ‘Disasters of War’ images are called to mind. 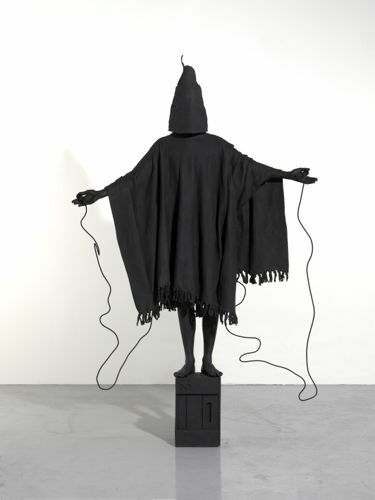 The life-size bronze figure references a famous image of a prisoner in Abu Ghraib during the Iraq War and brings the audience face to face with the darker side of contemporary society. 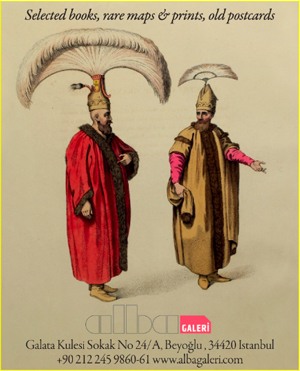 The exhibition runs until April 27, 2014. Main image is of the work ‘The Origin of the World (Classis Madagascariensis)’, 2012. Photo: Murat Germen. Courtesy of the artist and ARTER.